To be used as an aid during periods of intestinal dysfunction such as diarrhoea or malabsorption. An ideal daily supplement to support the digestive and immune systems. Use in times of stress, illness, injury, and/or post antibiotic treatment to support the immune and digestive systems. 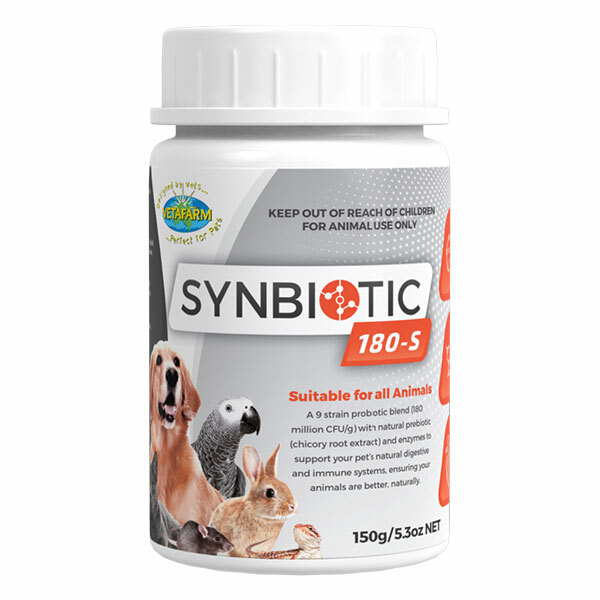 A 9 strain probiotic blend (180 million CFU/g) with natural prebiotic (chicory root extract) and enzymes to support your pet’s natural digestive and immune systems, ensuring your animals are better, naturally. Probiotics: (180 million CFU/g) Lactobacillus acidophilus, L.casei, L.salivarius, L.plantarum, L.rhamnosus, L.brevis, Bifidobacterium bifidum, B.lactis, S.thermophilus. Prebiotics: Inulin (chicory root extract).